In season, ESC tends to sell Lautrec Pink garlic either loose or in 1kg strings. Pink Garlic was reputedly introduced to Lautrec during the Middle-Ages when a local innkeeper allowed a guest to settle his bill with garlic cloves. The innkeeper planted the cloves and the rest is history! Renowned for its colour and delicate flavour, Lautrec Garlic was awarded PDO status in 1996. France has a variety of various festivals or fetes celebrating local specialities - I was once taken a Fete des Cochons, or Pig Festival, in Troyes, celebrating the local Andouillette sausage! - and Lautrec is no different, where there's a Pink Garlic Festival every August celebrating the new harvest. 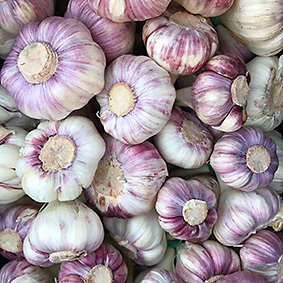 There is even a Brotherhood of the Pink Garlic of Lautrec (Syndicat de Défense du Label Ail Rose de Lautrec) set up in 2000 to promote the garlic and Lautrec's culinary tradition!